-- Select a Size -- X-Large - Out of Stock! 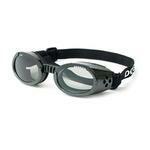 Doggles - ILS Shiny Black Frame with Smoke Lens Customer Photos - Send us your photo! Zorro wearing his doggles. I'm almost always asked 'does he keep them on?'....yes! Oliver is a three year old pug that loves being outside, hiking and climbing and playing! He really likes his new Doggles sunglasses! Paisley Pepsi and Prada love the protection they get from the wind and sun with their doggles. Tripple cuteness! The Claw loves taking a ride to Grandmas with her new Doggles! For Milo's 2nd birthday he received a pair of doggles along with the hoodie and baseball cap - all from Baxter Boo. Our little rescue in his stylish new doggles! Otis enjoying a bike ride. Everywhere we go, including Las Vegas on vacation, people are amazed at how well we wear our doggles. We never go out in the bright sun without them!! The suns so bright, I've gotta wear shades! We love spending the day down at the beach. And it's important to have sun protection for both us and Mac. Mac likes to sport his doggles down at the beach. And people love it when he does, it makes people smile. Cooper is a 12 year old Bichon. We are currently spending time down in Florida. I noticed he was having a hard time with the sun so I got these glasses for him and he struts around like a little movie star, Cooper, as in Gary Cooper. He is also wearing his Yappily Ever After tuxedo we bought for his recent wedding to his beautiful bride Miss Belinda Belle. This picture was taken June 22, 2013 right before his Aunt Karen's wedding. He got to walk down the aisle with her. But these glasses seem to be very comfortable on him and he doesn't fuss with them at all. Very very pleased. Thank you Baxterboo. Bentley with his new Doggles eye-wear, feeling very much like a rock-star! Boo Loves his Doggles from BaxterBoo, He knows when I get them out it is time to Ride! Riding the Bike with Mommy is his most favorite thing to do.We ride for Multiple Sclerosis & for Fun! These things are cool. Takes a little training but what doesn't? Bone. James Bone. Mac brings a smile to everyone we meet, everywhere we go, while wearing his Doggles. Many of times, we would get a swarm of people that want to take a picture of him. Not only does the Doggles get him fans (hahaha) but it helps protect his eyes from the harsh sun (no more squinting and watery eyes). We are photography enthusiast so we like to take our cameras down to the beach and other places. And Mac is always with us, so it's important to not only protect ourselves from the sun but to protect him too. With the Doggles, we have made friends and fans from all over the world. We've met people from Brazil, Canada, Tennessee, UK, Japan, and many others. Thank you BaxterBoo and Doggles for the opportunity to meet all these people. Spring has sprung while Lulu sports the shades! Our doggies love their doggles. They love to "surf" out the car windows and the doggles protect their eyes. Sam wearing his doggles for the first time! I am NOT Roy Orbison!!! Max in his Doggles cruising the streets on LA! This is my grand-dog, Chico, who visited from Memphis, TN at Christmas. He loved his doggles and looks forward to riding in the convertible with his owner, my son Matt. Mac is waiting in his custom box for the driver to show up so the ATV can take off. I am ready for a ride in the car. Maximus loves riding on the Harley with his doggles on. Ama was dressed to the nines in support of the dog-a-thon! "I'm ready for any adventure wearing my Doggles!" "Love kayaking with my doggles on!Everyone says I look so cute." Are we there yet? You can see that Kona is also sporting his harness and sitting on his seat cover. Buddy loves his doggles because they keep the wind from hurting his eyes as he sticks his head out the window when he is in the car. Not to mention how super cool he looks! Ollie in his doggles and sporting a tie dye t-shirt. Thanks Baxterboo, you make it so easy to keep him stylish without breaking the bank! Buddy loves to hang his head out the window now his eyes are protected from wind and anything else! Our little biker girl just loved her Christmas present this year. Allie is ready for the Motorcycle Life at 16 years of age! Boat Breezes and Googles, won't have it any other way. Kobe "Rockin Doggles Goggles" My pittie and I were the center of attention! We love it, We LoVe It! Tucker enjoying a day on the boat. life vest and doggels make the day fun! Moxy loves riding in her bike basket, and now her eyes are protected with Doggles from flying debris! Muffin keeps her Doggoggles on, while she's outside. Spike, my biker Bichon, loves his Harley rides so much more - now that he has his new Doggles. My future's so bright, I gotta wear my Doggles! Jack ready for some sun!! My biker baby. I don't go anywhere w/o her. Ranger resting on our hike up the trails around Austin. Knick-Knack chillin' in the yard with his shades on. Just got my new Doggles, I'm cool! Buddy test driving his new Doggles out the car window and loving it! Ready for the golf cart! Let's Ride! Posted On 04/05/18 by Cristy T from St Louis, MO Yes, Cristy T recommends this product! He loves to stick his head out the sunroof. All that wind and possibly a bug flying into his eye worried me, so I bought these Doggles. I must say, they are AWESOME! Yes for safety reasons, but also for fitting great on my long nosed Weimaraner. There's a strap that goes under the jaw that keeps these in place perfectly. There's enough give to them to be comfortable for my pup, they cover his eyes completely and stay on when he paws at them the first few minutes as we train to wear them. My only mistake was buying the smoke lenses for a first timer. I would suggest clear lenses for newbies. I think my pup is very confused by the light to slightly dark every time the Doggles are put on. Posted On 11/06/17 by John P from Port Haywood, VA Yes, John P recommends this product! I bought these for my 140 pound female Newfoundland who loves to ride in my pickup and stick her head out the window. She didn't want them on in the house, but once she got use to them in the truck she would hang her head out in spite of the speed we were going. It used to be that over 40 MPH she'd only briefly try to stick her head out. Work comes to a halt through a local road construction zone as we pass through because all the workers are fascinated and entertained by the stylish look of Xena of her "Doggles". Posted On 06/10/17 by Cherie M from Ringgold, GA Yes, Cherie M recommends this product! We bought these doggles for our youngest pug, Oliver. He loves wearing them! They adjusted easily to fit him perfectly. He will be wearing them on our hike tomorrow! Posted On 03/07/17 by Dana T from randallstown, MD Yes, Dana T recommends this product! Posted On 03/04/17 by Tracy W from Fort Smith, AR Yes, Tracy W recommends this product! I absolutely love the Doggles on my Yorkie Masen. They are adjustable and fit him well. Posted On 01/28/17 by Kelly C from Lees Summit, MO Yes, Kelly C recommends this product! For the price and what you actually receive it is GREAT!! I have a Frenchie and they fit perfectly. No negatives here. LOVE THE DOGGLES. Posted On 10/25/16 by Robin W from Saint Charles , MO Yes, Robin W recommends this product! Got the doggles for my dog and he loved them. Sat outside enjoying a sunny day. He did not know what to think at first then quickly enjoyed them. Posted On 09/08/16 by Debbie from East Haven, CT Yes, Debbie recommends this product! They look great and we get lots of compliments. I like that they shield his eyes in bright sun. Gotta protect our eyes right? Posted On 02/16/16 by Alicia from El Paso, TX Yes, Alicia recommends this product! 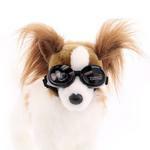 These Doggles goggles are great when I take my puppy on the motorcycle. The fit is perfect. Posted On 12/11/15 by donna w from Bentonville, AR Yes, donna w recommends this product! These are the cutest goggles for my little dog. He will be riding with dad on the Harley & looking really cool. Posted On 11/15/15 by Sara H from Columbia, SC Yes, Sara H recommends this product! Well, the fit was a little big but I wanted them to cover an eye infection and they just won't do the job. I guess I really need an eye patch but haven't been able to find one for dogs. The quality of the item and your service has been excellent and I thank you so much! I wasn't sure what size to get, so I purchased the x-small (approx. 3 3/4 inches wide w/approx. 3/8 inch wide for nose) and the small (approx. 5 inches wide w/approx. 1/2 inch wide for nose). Just for your info one of my dogs weights 11 lbs. and the other 15 lbs. I kept the small for both of them. The doggles are really cute on, but at this time my maltese are not used to them. I'm sure after a while they will be perfect, because right now they have to squint when they look at me in the South Florida sun! Posted On 04/20/15 by CAROL from LAGO VISTA, TX Yes, CAROL recommends this product! I have a 12yo Boston Terrier who had developed Corneal Edema which made his eyes prone to corneal ulcers. His condition is being treated by his veterinary ophthalmologist and is on the road to recovery. In the meantime, the Dog Goggles that I have recently purchased from Baxter Boo helps to protect his very big and bulgy BT eyes from further damage by low lying brushes and twigs, cacti, and harmful ultraviolet light that can potentially further damage his eyes. The chin strap and the back strap are easily adjusted. The medium size goggles stay on and is comfortable on my 22lb dog!!! It was easy to train him to get used to it. My suggestion is to have the dog wear it for only a few seconds the first time around, followed by lots of praises and a treat. Then increase wear time for a few more seconds every day. Also, place the goggles where there is a lot of sunlight so it does not freak the dog out that his surrounding are suddenly a bit darker. Posted On 03/17/15 by Rhonda Z from Kalispell, Yes, Rhonda Z recommends this product! Posted On 12/25/14 by Joan K from Lakewood, OH Yes, Joan K recommends this product! Very happy with this product and like the darker frame best. Posted On 10/19/14 by norene m from white city, OR Yes, norene m recommends this product! Even better quality than I was expecting. My English Bulldog it the hit of the neighborhood with the doggles, his baxterboo shirt and a hat. Love him, love them and Baxter boo rules. Posted On 05/12/14 by John K from Miami, FL Yes, John K recommends this product! Bought these for my pit bull for our walks along the beach. Keeps sand out of his eyes, not to mention how cool he looks with them on! With a little bit of training he wears them proudly! Posted On 11/07/13 by Nhi from Santa Monica, CA Yes, Nhi recommends this product! I'm so glad I got a pair for our little guy. We are out in the sun a lot during the weekend. Just like humans, dogs can get cataracts too. This was perfect, as they are stylish and provides the protection needed. Mac use to get runny eyes while in the sun, now, all he gets is attention from people. We get stopped all the time for photos of him in his Doggles. Great product! Thanks! Love the variety. Have purchased coats for very large and small dogs. Toys for both dogs and cats as gifts. Can always count on a sale to save so I am able to purchase even more. Have been able to exchange easily.